Historically, Thassos is among Greece's richest islands. Inhabited as far back as 2000 BC, its rich pine woods, white marble and wonderful climate made it attractive to Phoenician colonisers, Romans and Greeks. Today, visitors can see the legacies of these cultures at various archaeological sites. Limenas is the island's capital and main port. 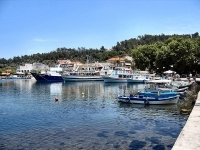 Visitors will find its old harbour full of colourful fishing boats and traditional tavernas. The lovely villages of Panagia and Potamia are within easy reach, while the quieter Kinira, with its pebbled beach, is a little further away. So too is the nudist, pinewood-ringed Paradise Beach. The west coast is home to a series of quaint fishing villages, interspersed with lovely coves and beaches. Visitors can explore charming old mountain settlements farther inland.